May 27, 2018 at 12:02 am. After scoring 46 points in another elimination-game special for the Cavaliers in Cleveland on Friday night, James returns to the scene of his 2012 magic and tries to do it again in Game 7 of the Eastern Conference finals Sunday night. “It’s about just winning the game now,” said Boston’s Marcus Smart, who has done his share of mixing it up with James in this series. “It’s not going to be pretty. You got to be able to get down and get dirty. You can’t go out and try to look pretty. You have to be ready for a dogfight. James, seeking his eighth straight trip to the Finals, comes in averaging 34.9 in Game 7s — including his 45 to help eliminate the Indiana Pacers in this year’s first round. In his career, he has averaged 34 per game in going 13-9 in elimination games. In Game 6 of the 2012 Eastern final, he went for 45 points, 15 rebounds and five assists to keep the Miami Heat alive before they won Game 7 back home. Before Friday night’s game, Cleveland coach Ty Lue told his team (and others), “Three, three, three,” meaning their season had either three hours, three days or three weeks remaining. 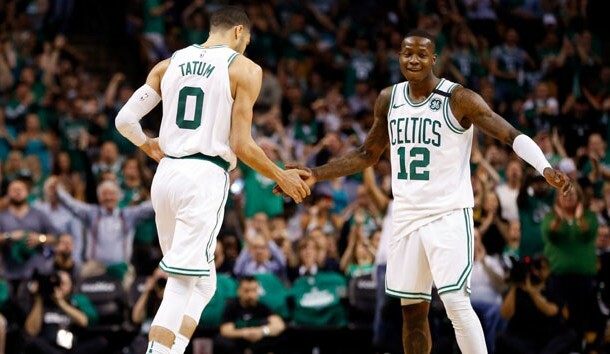 They were able to take care of the first part — and did it basically without Love, with former Celtics player Jeff Green filling in and having a strong game. “As we talked about all year, tomorrow night is not going to be perfect. … You just have to have perfect intentions,” Stevens said Saturday.